Original drawings by BSA partner Bo Helliwell and Blue Sky Design co-founder Michael McNamara have been featured in the Cabin Fever exhibition at the Vancouver Art Gallery, which traces the evolution of the cabin in North America. This classic Hornby Island cabin, designed by Lloyd House with drawings by BSA partner Bo Helliwell, is examined in the Vancouver Art Gallery’s Cabin Fever exhibition catalogue. A richly detailed monograph investigating the cabin as a typology, this book includes case studies from across North America. 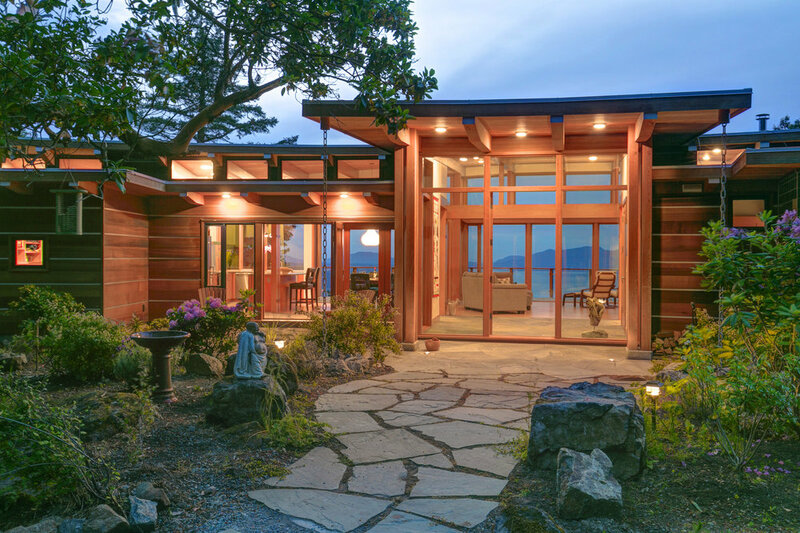 Blue Sky Architecture’s use of western red cedar, a quintessentially west coast material, made it a perfect fit for the Western Red Cedar Modern Architecture Series by Real Cedar. The Lakeshore House has been awarded an Award of Excellence at the Livable City Design Awards, which celebrate architectural excellence and creative urban management in the City of Kingston. "This home was built on the last undeveloped lot on Lakeshore Boulevard, a property owned by the family for over forty years. With the intention of building a sustainable, accessible home that will last for generations, they created a home that accommodates a live/work lifestyle, aging in place, and a centre for their extended family. View the winning projects here. The Arbutus House is featured in the 2016-17 edition of the Canadian Wood Council's Celebrating Excellence in Wood Architecture, which features winning design projects from around the world. "Locally sourced fir and red cedar achieve minimal environmental impact with maximum elegance." The Arbutus House was awarded a Gold Construction Achievement and Renovations of Excellence (CARE) Award for Best Single Family Detached Home $1,000,000-$1,500,000. "The CARE Awards highlight Canada's finest West Coast Homes and the skilled people behind them." - Casey Edge, Executive Director, Victoria Residential Builders Association. Congratulations to our project team: Rob Parsons Construction, Chiu Hippmann Engineering Inc, and Timber Supplier JMC Forest Maintenance Ltd.
Bo and Kim presented two lectures as a part of the seventh edition of the International Cycle of Conferences of the Isthmus School in the City of Knowledge, Panama. They join other guest lecturers from Austria, Colombia, Cuba, Chile, Mexico, and Panama.